Since 1998, Palmex has specialised in the production of synthetic palm leaves used in the construction of exotic roofing. By choosing our materials, you are opting for durable, resistant and 100% recyclable products. Palmex products are designed to bring a permanent solution to the problem of the massive and growing harvesting of natural resources used for exotic roofing. They thus minimise the general impact on our economic and housing development use of natural and viable resources in our home environment. Our products contain no toxic substances, they are made to the ISO 9001-2008 standards and are made in part, using recycled materials. Palmex is proud to offer a range of eco-friendly products which respond to current needs, without compromising the capacity of future generations to respond to their own. An exceptional quality for a durable and resistant product. Of industrial quality, the resistant qualities of our materials are ideal for all types of climate. The durability of Palmex products is guaranteed 10 years and has an estimated lifetime of 50 years or more. During their production, our synthetic palm leaves undergo a specific anti-UV treatment which allows precious energy savings on air conditioning and ventilation. 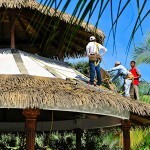 Since our creation, more than 42 countries worldwide have opted for roofing using our exotic, synthetic palm leaves. Whilst offering you an aesthetic look of natural palm leaves, these materials assure you real peace of mind when it comes to long term maintenance. 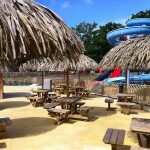 The installation of these, Aloha or Rio synthetic palm leaves is very straightforward. With a minimum slope of 30°, you can be completely waterproof. There exist for these types of leaves fire-retardant version on demand. The Rio leaves are designed to be fixed directly on to an existing roof such as wooden panels, cladding, metal sheeting, whereas the Aloha leaves are fitted to the framework by a system of patented rails. 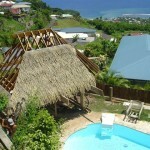 These offer an apparent sub-roof with a traditional look which is popular in many countries. Designed to be fixed onto wooden panels or any other finishing trim. 50 years life-span/10 years guarantee. Adapted for direct fixing to the framework. 50 years life-span/10 years Guarantee.